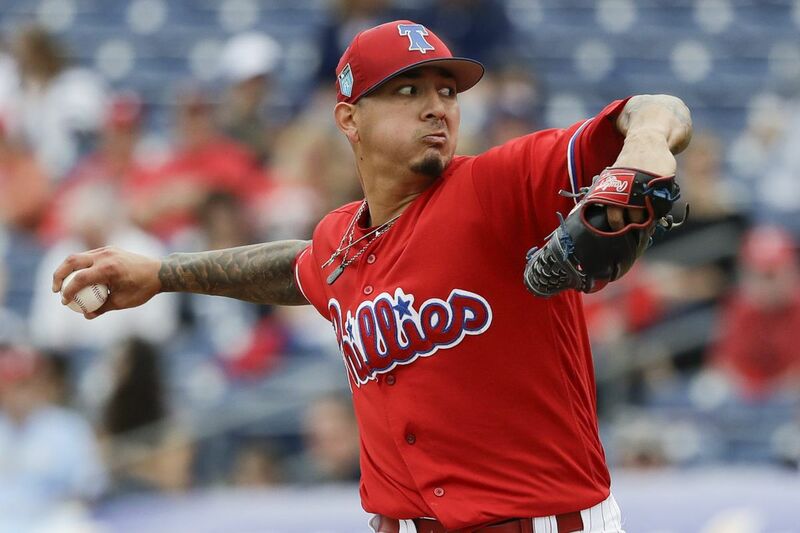 Vince Velasquez pitched four shutout innings Saturday. CLEARWATER, Fla. – Hector Neris served up a three-run homer in the ninth, and the Phillies fell to the Rays, 5-3, at Spectrum Field. Velasquez had his best outing of the spring. He was efficient with his pitches, throwing 35 of his 51 pitches for strikes. Velasquez had good command of his secondary pitches and attacked with his fastball. He has worked this spring on holding runners, and it was a good sign to see him pick off Jake Bauers at first base in the second inning. "That's my first career pickoff. Ever. Ever," Velasquez said. "I've never picked anyone off. I wanted to keep the ball after that. Just holding the ball, and it's impressive how you can mess up the hitter's timing and the runner's timing and also allow [catcher Jorge] Alfaro to throw that guy out. It's amazing what you can do by just holding onto the ball. You feel like you're in control of the game." Neris blew the save in the ninth when he gave up a three-run homer with one out to David Olmedo-Barrera. Neris retired the next two batters to finish the inning. This was Neris' fifth spring outing; the previous four were scoreless. Scott Kingery played center field for the second time this spring but did not see any action. The second baseman has also spent time at shortstop and might play third base. He did not get a fly ball hit to him last week, when he played center for the first time since college. The Phillies batted their pitcher eighth, as they chose to not use a designated hitter for the first time this spring. There's a good chance this could be a trend the team uses in the regular season, following a pattern of other analytically inclined teams. The reasoning is that having a position player bat ninth would create more RBI chances for the top of the order. Next up: The Phillies will play their first of two road night games when they travel to Sarasota on Sunday to face the Orioles at 6:05. Nick Pivetta will start for the Phillies.